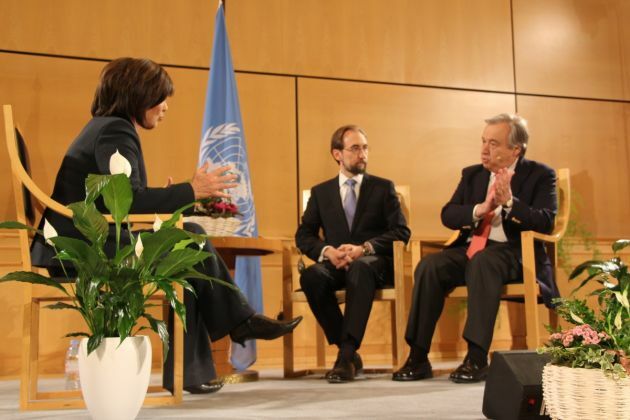 (Photo: © Peter Kenny)From left, CNN's Christiane Amanpour interviews United Nations High Commissioner for Refugees, António Guterres (center) and U.N. U.N. High Commissioner for Human Rights Zeid Ra'ad al-Hussein in Geneva on March 12, 2015. GENEVA - The World Council of Churches and the All Africa Conference of Churches have come together in expressing grave concern for the people of Burundi in a situation of extreme tension and escalating human rights violations. Over the Christmas period fears have arisen that months of violence could end in civil war. In Uganda on Dec. 28 rival Burundi factions held peace talks The talks in Uganda's presidential palace in Entebbe, just outside the capital Kampala, chaired by Ugandan President Yoweri Museveni, who is seeking to mediate in the crisis, Agence France-Presse reported. of communal tensions," said the WCC and AACC in their 18 Dec. statement. Violence in Burundi's rose sharply in April when President Pierre Nkurunziza announced his intention to run for a controversial third term, which he went on to win in July. In a joint statement issued on 18 December, the WCC and AACC said the political crisis in Burundi "has latterly been marked by brutal violence, targeted attacks, extrajudicial killings, severe oppression and the incitement of communal tensions." "We appeal to the government and political leadership of Burundi to step back from the path of violence onto the path of peace", their joint statement reads. At least 400 people have been killed since April 26 and the death toll may be considerably higher says the UN. Of these, up to 68 may have been extra-judicially executed in November. At least 3,496 people have been arrested in relation to the political crisis. Human rights defenders and independent journalists have fled the country and gone into hiding. And 220,000 people are now refugees in neighboring countries, with many others internally displaced. The WCC and AACC call for "responsible leadership that does not tolerate complicity in the killings and other serious violations now so obviously prevalent in the country." "In this Advent season, in which we await the nativity of the Christ Child, the Prince of Peace, we pray that all those who now espouse violence and division in Burundi will learn and pursue the things that make for peace in this wounded land," the statement concludes. On the same day U.N. High Commissioner for Human Rights Zeid Ra'ad Al Hussein urged the international community to take "robust, decisive" action on the situation in Burundi, to avert a civil war that could have serious ethnic overtones as well as alarming regional consequences." He noted, "Burundi is at bursting point, on the very cusp of a civil war." Zeid said recent carnage has confirmed the extent to which violence and intimidation are catapulting the country back to the past, "to Burundi's deeply troubled, dark and horrendously violent past...and has only served to move the much-needed political solution further from reach." He warned of the "growing, alarming risk of regionalisation of the crisis" and stressed the need for all States, but Burundi's neighbors in particular, to play a constructive role in defusing the situation.